Time for another gear review as my cycle computer approaches the 20,000km mark. Some 10,000km ago I wrote this as I waited for the uncertainty surrounding the Presidential elections in Guinea to pass over. Now I’m in the Congo waiting for a boat to transport me up the river here (I was when I wrote this). The end of the road in Liberia is close. Another 20km from here and a river divides the country from it’s Francophone neighbour – Cote d’ Ivoire. Stretching to either side of me are two long palm-fringed beaches and I’m surrounded by the ghostly remains of large war-ravaged buildings. 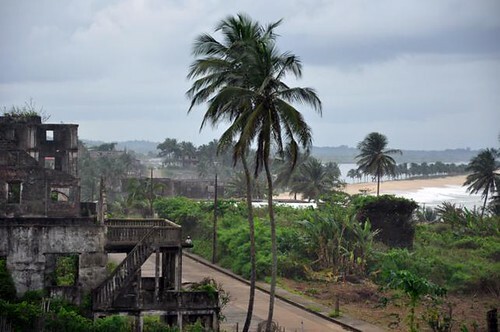 The town of Harper here in the far south of Liberia is now a sad shadow of what before the war must have been a prosperous place, for a minority anyhow. Half-way to Cape Town yet? Unless I start pedalling a much straighter route, which is usually far less fun, I can confidently say no. Guinea Bissau, where my speedometer ticked over 10,000km recently, does not appear to be equal distance from England and South Africa. 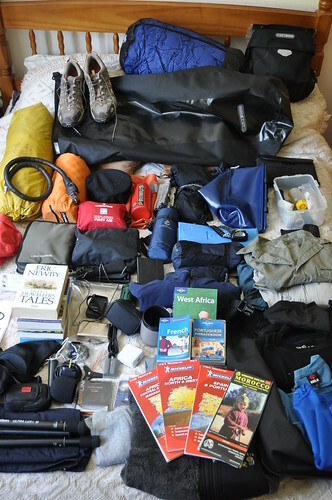 The distance I’ve come does however provide a good opportunity to review the gear that’s got me here. What has lasted, been replaced or sent home. It’s not an exhaustive critique, and if the words Rolhoff, Schwalbe and Ortlieb appear all too unpronounceable, you may wish to stop reading now. The World is a book and those who not travel read only a page.